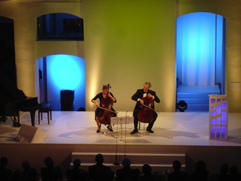 As part of the Holocaust Memorial Day / International Holocaust Remembrance Day, remembering anniversary of the liberation of Auschwitz by Soviet troops on 27th January in 1945, will appear two Czech cellists - sister and brother Anna Brikciusová and František Brikcius with programme "Duo Brikcius - 2 Cellos Tour Preview" in Main hall in Senate of the Czech Republic in Prague. 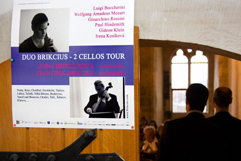 Duo Brikcius will feature Duo for Violin and Cello (1939-40) by Jewish - Terezín composer Gideon Klein and Fantasie IV (2008) by Czech composer and organist Irena Kosíková (father of Irena Kosíková, philosopher Karel Kosík, has been prisoned in Terezín during WWII). In the cooperation with the Senate of the Czech Republic, the Federation of Jewish Communities and the Foundation for Holocaust Victims under auspices of Chairman of the Senate Přemysl Sobotka. All seats are already taken. For more information http://www.Brikcius.com , http://www.FZO.cz , http://www.Senat.cz a http://www.iKosik.com . How many strings has cello? Contest is over, drawn winners are: P.M from Castle Douglas and K. Č. from Prague. Radio Proglas is radio partner of project "MAKANNA". Listen Radio Proglas on Friday 22nd January 2010 at 4.55pm and on Wednesday 27th January 2010 at 00.05am, interview with cellist František Brikcius, talking about concert performance of ballet "MAKANNA" of Czech organist and composer Irena Kosíková in the occasion of 110th anniversary of Jewish writer Jiří Weil. Swiss composer and radio producer Conrad Beck was born on 16th June 1901 in Lohn, Schaffhausen. After short time of mechanical engineering studies at the Eidgenössische Technische Hochschule in Zürich and private music lessons with Müller-Zürich, he started to attend the Zürich Conservatory, where he studied composition with Volkmar Andreae, counterpoint with Reinhold Laquai and piano with Carl Baldegger. He stayed in Paris between 1924 and 1933, where he studied with Jacques Ibert and socialise with the circle surrounding Arthur Honegger, Nadia Boulanger and Albert Roussel. At the suggestion of Swiss conductor Paul Sacher, who promoted his career more than any other composer, he settled down in Basel in 1934. 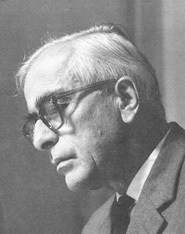 During a period of over 50 years, Sacher commissioned his works and conducted their premieres with the Basel Chamber Orchestra and the Collegium Musicum Zürich. From 1939 to 1966 Beck worked as music director of Swiss Radio in Basel, a position that enabled him to do a great deal to promote contemporary music. His honours include the composition prize of the Schweizerischer Tonkünstlerverein (1954), the Ludwig Spohr Prize of the city of Brunswick (1956) and the Basle arts prize (1964). He is dying on 31st October 1989 in Basel. Together with another 11 composers - friends (C. Beck, L. Berio, P. Boulez, B. Britten, H. Dutilleux, W. Fortner, A. Ginastera, C. Halffter, H. W. Henze, H. Holliger, K. Huber a W. Lutoslawski) of Swiss composer and maecenas Paul Sacher (1906 - 1999), he was asked by Russian cellist Mstislav Rostropovich on the occasion of Sacher's 70th birthday to write composition for cello solo with use of notes creating his name (eS, A, C, H, E, Re). Conrad Beck created three movements piece FÜR PAUL SACHER, DREI EPIGRAMME FÜR VIOLONCELLO SOLO. Compositions were partially presented in Zurich on 2nd May 1976. 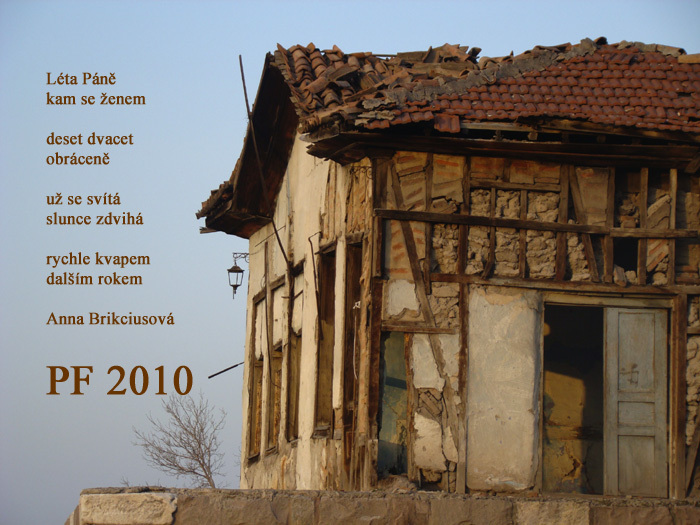 Whole "eSACHERe" project will be (for the first time in complete performance) performed by Czech Cellist František Brikcius this autumn 2010 in Prague. For more about Conrad Beck visit http://www.Brikcius.com and http://En.Wikipedia.org/Wiki/Conrad_Beck .